Jeanne Carreau fell in love with clay 50 years ago in a High School ceramics class in Kansas. She joined a pottery cooperative at Stanford University, majored in Japanese Culture and dreamed of studying pottery in Japan. This became reality in 1974 when Jeanne arrived in Japan with $150 and the determination to find a pottery teacher. Jeanne was apprenticed to Jun Oba in Tokyo from 1974-1976, overcoming the challenges of being a female apprentice and a foreigner. Following her apprenticeship, she entered an M.A. program in East Asian Studies at UC Berkeley. At that time, the UC Board of Regents didn’t permit work on the potter’s wheel, viewing it as “craft”, not fine art. Consequently, Jeanne returned to Japan, spending 2 years writing a Masters Thesis comparing the ceramic traditions of Hagi and Bizen, interviewing renowned potters including Shoji Hamada, Deika Sakata, Ryosaku Miwa, Michiaki Kanashige, and Yu Fujiwara, and making work in their studios. Peter Voulkos, a professor of ceramics at UC Berkeley at the time, was a reader of Jeanne’s thesis. Jeanne next lived in Hong Kong from 1978-84, teaching at HK Polytechnic College, HK International School, and German-Swiss School as well as maintaining her own studio. Producing handmade pottery of quiet beauty in this most urban, commercial environment was challenging, but Jeanne says that her years in HK were a turning point in her life and art. The determination to thrive and the boundless energy of the people there became her inspiration. Jeanne has lived in New York since 1984 and taught ceramics at the Pelham Art Center (Pelham), the Clay Art Center (Port Chester) and the Rockland Center of the Arts (West Nyack), to both adults and children, including those with special needs. Her own work is primarily wheel thrown and functional with a sculptural sensibility. She enjoys pushing clay and herself to the limit, making simple large forms that are both graceful and powerful, glazed to accentuate the movement and serendipity inherent in the firing process. 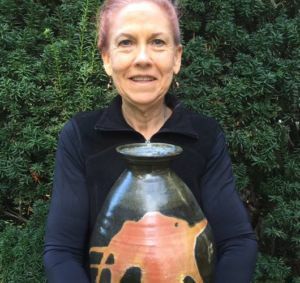 Jeanne Carreau has exhibited her work in Tokyo, Hong Kong, California, and New York, most recently in a solo show in Hong Kong “Jeanne Carreau: 50 Years with Clay” (see accompanying YouTube video: https://youtu.be/VDlEI-1NfYM). She has presented lectures to the Manor Club, Pelham, “A Potters Apprentice in Japan” (1996), the Hudson River Potters, Port Chester, “A Potter’s Apprentice in Japan” (1988), and for the Festival of Asian Arts, “Contemporary Japanese Potters and Their Work”, Hong Kong 1981, as well as publishing articles on Japanese pottery for the Encyclopedia of Japan (Kodansha 1983), translating a book on Japanese folk pottery from Japanese to English (Kodansha 1981) and compiling the English language glossary for Kutani Ware (Kodansha 1979). Her MA thesis for UC Berkeley is The Japanese Ceramic Tradition, Bizen and Hagi, Two Expressions.